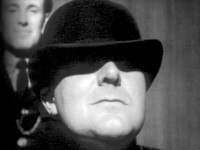 After an informant widely regarded as guilty is acquitted of treason, he and Steed, who are somehow associated, celebrate the outcome at a pub. But Cathy publicly confronts them with her doubts, and so Steed plots Cathy's murder. Sure enough, after her murder is witnessed, amazingly, Steed is acquitted! This was a snappy way to get the second season started (it was the first to air). The convoluted and deliberately misleading first half is effective, and the highly detailed plotting is engrossing. Kudos, Brian. My only quibble is that Harold Scott and John Laurie, as the crooked lawyer brothers, went just a wee bit too far OTT at times, but this is easily forgiven. 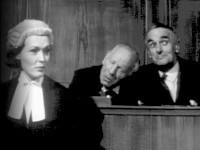 Helen Lindsay appeared in the Police Surgeon episode, "Man Overboard." Studio paperwork for this episode identifies it as "Project 3600." In a rendezvous following Cathy's "murder," Seed greets Cathy with, "Liveliest looking corpus I ever saw—oh, and very dilecti, if I may say so." The next best line is actually a blooper: very close to the climax, Miles Lakin is telephoning his assistant and in his panic he says, "In the bottom desk of the drawer is a bunch of keys..."